Ever since childhood I have been captivated by the Beauty and the mystery that the universe holds, born over 13.7 Billion years ago and home to over 100 Billion Galaxies, each said to contain 100 Billion Stars. The chance that we will ever fully understand every secret that the universe contains remains Infinitesimally small, but humanity and it's inherent Curiosity will never stop trying to uncover those secrets, and although our physical exploration of space has yet to truly reach beyond our Solar System there is still much for us to learn within it and one of the most audacious and technologically advanced machines that man has ever built is currently exploring the secrets of a world 35 Million Miles from Earth at the closest point of its Solar orbit, This world is Mars also referred to as The Red Planet and this monumental technological achievement is The Curiosity Rover. The aptly named Curiosity Rover (aka The Mars Science Laboratory) is around 10 Feet long, 7 Feet Tall and weighs just under 143 Stones (2000 Pounds) it is powered by a Thermoelectric Radioisotope Power Generator which utilises the heat generated from plutonium 238's decay and converts it into the Electricity used to power Curiosity which gives it around a 2 year lifespan on the surface of the red planet, the Power Supply is not even the most High-Tech part of this amazing machine. 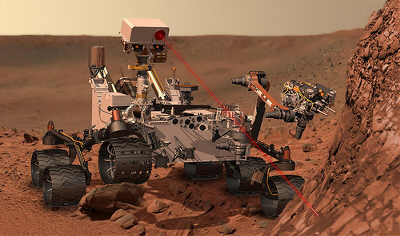 Curiosity has a Laser that can Vaporise layers of Martian rock and determine the specific Atoms released or excited by it from 23 Feet away!! This magnificent Laser is part of a Laboratory (hence Curiosity's pseudonym) that is capable of analysing samples taken by drilling into rocks or simply scooped from the ground and is capable of moving these samples from one Scientific Instrument to another via internal chambers, including a Laser Spectrometer which will be able to determine the composition of the sample. 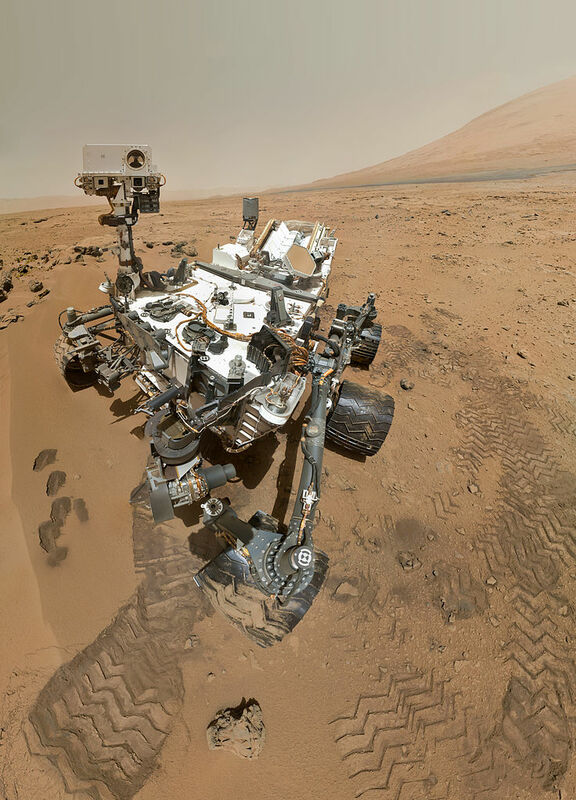 There are 17 Cameras on Curiosity which has already returned over 50,000 images of the Martian surface (which can be viewed online, link after article), one of those Cameras is the Mars Hand Lens Imager (MAHLI) which is capable of taking magnified images of soil, rocks and if present ice, It can reveal details smaller than the width of a human hair. These are just a few of the amazing tools at Curiosity's and NASA'S disposal. Curiosity Landed safely in Gale Crater on 5th August 2012 after a daring and never before used approach and landing system (depicted in the below video) including an amazing rocket powered Sky Crane that slowly descended to around 7 metres from the surface before delicately lowering Curiosity and successfully allowing her to touch down on the Martian Surface, once Curiosity touched down the cables were cut and Sky Crane accelerated away at full throttle to ensure it landed at a safe distance from the rover. Since it's landing (which was a first in itself) Curiosity has made several important discoveries and conducted many more Scientific firsts, including the discovery that radiation levels on the surface of Mars were comparable to those found on the International Space Station which is imperative for any future colonisation hopes we as the human race hold for The Red Planet. Another key find was after Curiosity had drilled into a Martian rock (the first time this has been done to collect samples on another planet) and analysed the composition, the rock was found to contain key chemical ingredients such as Oxygen, Nitrogen, Hydrogen and Carbon suggesting that the area could have supported microbial life billions of years ago, clay minerals were also found that suggested the area was once abundant with water at that time again an indicator that some form of life could have been present at the time as life on earth thrives in areas with liquid water. These discoveries all point to a Mars very unlike the barren world we see today as a result of the stripping of it's atmosphere billions of years ago by the raging Solar Winds but perhaps with many similarities to the place we call home, Earth. Curiosity is not like any other robotic rover we the Human Race have sent to another world, this one for example is much more than just our eyes, it is also in my opinion an extension of our ingenuity in Science & Technology on a much greater level than earlier rovers, allowing us to learn more and more about the history of our Solar System and by extension the Universe, and perhaps will signify a new era of robotic exploration of our Solar System, one thing is for sure with over 1.3 Million followers on Twitter (Yes Curiosity likes to tweet) it is obvious that this not so little rover has sparked the interest of many minds including my own.